Here are some easy and delicious cookie recipes which you can make relatively quickly. It can be one of the unique Christmas gift ideas. Do you like to gift personalized gifts during Christmas? Have you ever thought of making cookies at home during Christmas and gifting them in nice boxes? If yes, then go ahead and make your desire a reality at this Christmas. 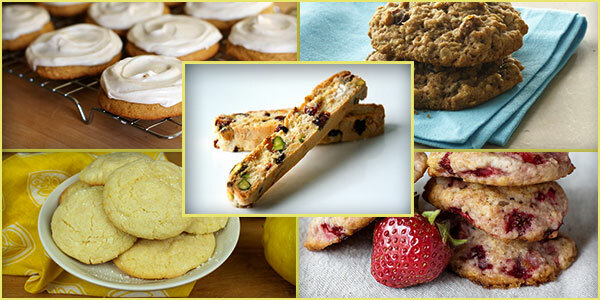 Here are some easy and delicious cookie recipes which you can make relatively quickly. It can be one of the unique Christmas gift ideas. Doing so, you can enjoy the pleasure of gifting something special to your friends and relatives this holiday. In a bowl, mix butter and white sugar. Add pumpkin puree, 1 teaspoon vanilla extract and egg, and beat till the mix becomes creamy. Then mix the dry ingredients. Take a cookie sheet and drop about 2 tablespoons of the mix and flatten a little. Bake the mix for 15-20 minutes and cool them. Glaze How to prepare: In a bowl, mix milk with confectioners' sugar, 1 tablespoon melted butter and 1 teaspoon vanilla. You can add milk if needed to meet the required consistency. Drizzle glaze, with a fork, into the cookies. Hull the strawberries and slice them into 4-6 pieces each. Sprinkle 2 tablespoons of sugar over the strawberries and keep them aside. In an electric mixer, beat brown sugar, white sugar, butter and vanilla until it becomes a smooth paste. Then add the egg and beat well. Turn the mixer off and add the flour along with baking soda and salt; Beat on low speed for sometime. It need not have to be a smooth paste. Take the strawberries, pat them dry with paper towel and very gently stir them into the mixture. Take a tray and line it with baking paper. Drop about 2 tablespoons of the dough into the tray. Keep gaps thus allowing them to spread. Bake for 10-12 minutes. Rotate the tray halfway. Keep baking until the cookies become deep golden brown. In a large bowl pour the cake mix. Mix lemon extract, eggs, oil and blend well. Take about 2 tablespoons of dough and drop it in a bowl of confectioners' sugar. Roll them around to make them lightly covered. Take a cookie sheet (ungreased) and place the sugar coated doughs. Bake for 6-9 minutes. The bottom of the cookies will be light brown and the inside will be chewy. Extra-large eggs (room temperature) - 2 nos. In a sheet pan, place the pecans and bake for 5 minutes until crisp. Then take the pan out and coarsely chop the pecans. In a electric mixer, at first, beat butter, granulated sugar and brown sugar on medium-high setting until the mixture is light and fluffy. Then, add vanilla and eggs, one at a time, and keep the mixer on low setting. In a medium bowl, sift together the flour, cinnamon, baking powder and salt. Then, keep the mixture on low setting and slowly add the dry ingredients into the butter mixture. Also add the raisins, oats, pecans and mix until they are combined together. Take a tablespoon or a small ice-cream scoop and drop 2-inch mounds of the dough into sheet pans lined with parchment paper. Now flatten them slightly with damp hand. Bake the mixture for 12-15 minutes until it's light brown. Now, transfer the cookies to a baking rack and cool them before serving. Take a large bowl, mix together sugar and oil until they blend well. Then, add almond extract and vanilla, and beat eggs. After blending, add flour, baking powder, salt and mix them slowly. After mixing the ingredients into a smooth dough, add nuts and cranberries and mix them with hand. Take a cookie sheet lined with parchment paper. Divide the dough into half, about 12x2 inches each and place them on the sheet. Bake the dough for about 35 minutes until it turns light brown. Remove the tray from the oven and cool it for about 10 minutes. Again heat the oven but this time set the temperature at 275°F. Cut the dough into ¾ inch slides. Place them on the sides of the parchment covered cookie sheet. Bake it for 8-10 minutes or till the cookies become dry. Cool them and serve. Tip: Wet your hands while handling the dough as it won't stick easily. These cookie recipes will surely set the perfect mood of your evening coffee or when you want to grab something quickly. Besides, you can serve these cookies at Christmas parties without breaking your budget. So, make them and enjoy gifting or relishing them during the holidays. Page loaded in 1.141 seconds.